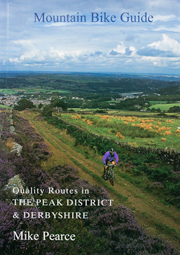 The Mountain Bike Guide - Quality Routes in The Peak District and Derbyshire - updates page. If you find any significant changes to any of the rides or know of any other information or links that might be useful to other users of the guide please contact me. Holmbridge and Digley route, page 66. The car park at the side of Digley resevoir (the starting point) has had a metal gate installed half way along the access road. The home owner has installed it due to anti-social behaviour on a night and locks it at dusk. I had to plead with her to let me out! Ride 24 - Whaley Bridge. Page 130 Line 13 - "Where the road straightens and becomes less steep go through a white metal gate on the right with a wooden stile next to it". The white gate and stile are gone, replaced with a cattle grid and small green metal gate. If you have an update please contact the author.